The small fishing village of Menemsha is the launching ground for arguably the best salt water fishing off the shores of Martha’s Vineyard. Menemsha is home to the multi-generational fishing families that define the ocean-faring culture of this historical island. It is also where you will find the premiere Menemsha Charter, North Shore Charters. Just a stone’s throw from the fish packed waters off the Gay Head Cliffs. 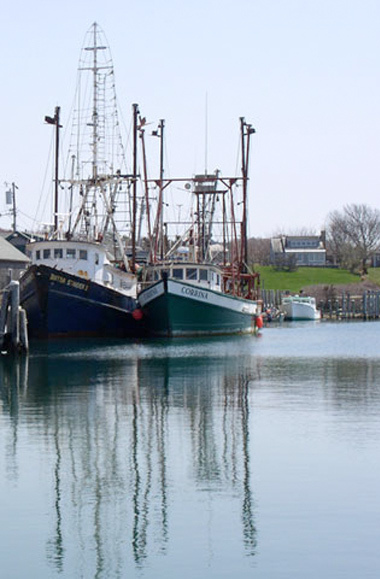 Menemsha charter fisherman, Scott McDowell is an expert in these waters. Capt. McDowell has over 30 years experience and never fails to find the big Striped Bass and Blue Fish that roam the coastal waters of Martha’s Vineyard. Anyone looking to experience the best that Meneshma Charter fishing has to offer will find everything they are looking for in North Shore Charters. After all, it is the oldest and best Menemsha Charter Fishing outfit. North Shore Charters also offers offshore charters, catering the big game fisherman looking for, Tuna, Marlin, Mahi-Mahi, or Shark. The history of charter fishing in Menemsha is long and storied. Also known as Menemsha Creek, it is home to a United States Coast Guard Station and the best Martha’s Vineyard Charter Fishing. The coast guard station recently burned to the ground in a tragic fire that damaged many of the Menemsha Charter fishing boats. Despite this set-back, Menemsha Charter fishing expert, Scott McDowell is ready to service all of your inshore and offshore fishing needs. Make your visit to Martha’s Vineyard more memorable by immersing yourself in the experience that is the fishing village of Menemsha, located in Chilmark MA. Booking a North Shore Charter is more than just a fishing trip, it is literally a connection to the early pioneers who survived off the fertile fishing grounds just outside Menemsha harbor. Be part of the history of Menemsha Charter Fishing by booking with Scott McDowell of North Shore charters. Menemsha is the perfect setting to begin your fishing expedition to plentiful waters of the Vineyard Sound. Offering Menemsha blue fish charters, as well as, Menemsha bass charters, Capt Scott McDowell has something for experienced anglers and families alike. If you are looking to land a trophy vineyard fish, captain Scott McDowell of North Shore Charters can make it happen. Capt. McDowell routinely lands fish in the 30lb to 40lb earning a reputation for North Shore Charters as the premiere Menemsha Charter Fishing experience. Commemorate your Menemsha Charter Fishing experience by purchasing a Custom Copper Bass, handmade by Capt. Scott McDowell of the Menemsha Copperworks. Scott McDowell also offers a variety of copper artwork including, Copper Bluefish, Copper Wall Hangings, Copper Chandaliers, and much more!